Bram Stoker’s brilliant classic of English literature Dracula, first published in 1897, has produced numerous film adaptations – from the sublime, like Nosferatu in both its 1922 and 1979 iterations; to the garbage, Francis Ford Coppola’s Bram Stoker’s Dracula (1992) for example. Though I acknowledge my views on the latter are not universal. Arguably no film adaptation of the novel has produced a more iconic interpretation of the novel’s central character though than Tod Browning’s Bela Lugosi starring Dracula (1931). Browning’s is a Dracula tale full of towering castles crawling with terrifying life forms (including somewhat absurdly an armadillo), an incredible orchestral score, those iconic Universal Horror sets (which intriguingly hosted the shooting of a Spanish Language version of Dracula at night at the same time this film was being shot) and plenty more that brings the atmosphere. The film is just so wonderfully staged. Apparently it is based heavily on a play based on the book and that sort of shows in the construction of the film as a whole, especially the way in which characters are introduced and plotlines set up. In comparison to most adaptations of Stoker’s novel, Dracula spends very little time in Transylvania, rather getting rather more quickly into the London set part of the story. The Transylvania set part still contains some of the most fun parts of the film. The scene where Dracula first sees his houseguest’s blood is pretty fantastic, with a dynamic camera zooming in to emphasise Dracula’s bloodlust. Before Lugosi comes out with the zinger “I never drink… wine”. It is undeniable that this 80 odd year old film does clunk at times. There seems to be a particular obsession with close-ups of Lugosi’s face shrouded in darkness, with only a strip of light over his eyes. It is impossible to talk about this film without discussing in depth Lugosi’s turn as Dracula. 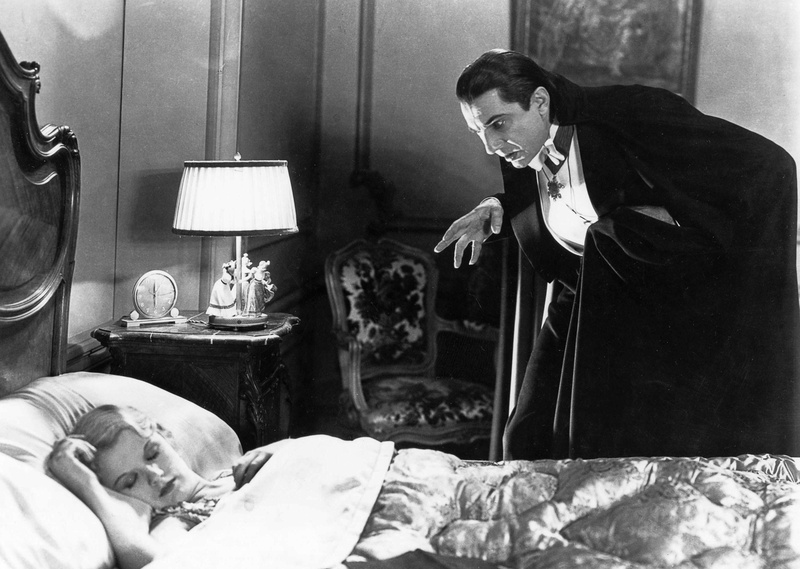 Indeed when most people think of Dracula, the image they have is not Stoker’s Dracula, it is Lugosi as Dracula. Look no further than last year’s fun animation Hotel Transylvania (2012), a film where Dracula as voiced by Adam Sandler looked a whole lot like Lugosi. Initially when watching the film this time around (I had seen it about 10 years ago), I was wondering if Lugosi’s performance was so iconic because of the actual performance itself, or just because of how his character looks. But it is immediately clear that Lugosi’s actual performance is really ace too. He has this shtick which he works throughout the film that just makes him seem to truly inhabit the role of Count Dracula. His Dracula is the bogeyman, both literally and figuratively, the dark force lurking in the shadows outside of a woman’s house in the darkness of night. It is easy to see why when so many people think Dracula, they think Lugosi. There is somewhat of a paradox at work here though. Because whilst Lugosi’s performance is stellar, he is not given the chance to show off his chops too much. Indeed Browning seems content to predominately focus on his (admittedly awesome) iconic look. Lugosi has some excellent support from other actors in the film too. In particular Dwight Frye as Renfield is really something else. Initially he hams it up wonderfully as the stranger in Transylvania who finds himself the houseguest of Dracula. 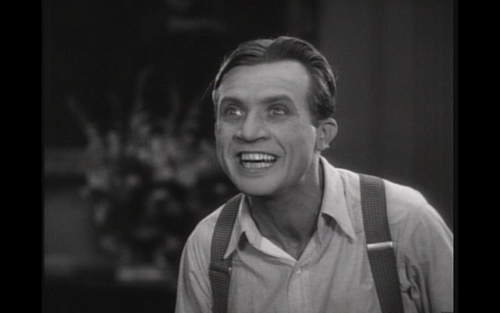 Once he is sent mad by whatever occurs in that castle though, Frye’s performance becomes even better, as he is transformed into a Peter Lorre-esque force of nature. His performance is probably the most horrifying aspect of the film, at least it was for me. Dracula is a very clever version of this ubiquitous tale that has stood the test of time and definitely deserves to be watched. It has to be seen to witness what is the most famous interpretation of the character of Dracula. But rest assured there is plenty else here to hold your interest as well. Nice review. It’s undoubtedly a horror gem though I do prefer Nosferatu. Cheers for commenting. Herzog’s Nosferatu is my favourite of the Dracula films I have seen. I love both this one and the earlier Nosferatu, and would probably rate them pretty similar. Great review. I actually think the Spanish version is the better film, it’s so much more polished. However, the guy playing Dracula is nowhere near as good as Lugosi. Stick him in the Spanish one and you’d have the best of both worlds. Yeah I have heard that about the Spanish language version. It is in the Universal Monsters blu-ray set I have, so I am definitely keen to check it out. Cheers for commenting. I do agree, however, that Nosferatu is indeed a masterpiece and that Browning’s Dracula, while obviously (as you noted) a little on the clunky side, has an undeniable magnetism, much like Lugosi in that role. And yes, Dwight Frye! Fascinating actor, fascinating life story. Hmmm, I may just have to go an wikipedia and investigate Mr Frye. I have to admit I know very little about him. I thought someone would take umbrage with my thoughts on Coppola’s Dracula. I know plenty of people who love that film. Whilst I agree about the technical elements of the film, I think the tone that they construct is just all wrong. Or at least it was for me anyway. One of my absolute favorite films of all time. The first I saw it was on TV the night before Halloween in 1982 and it impressed right away and still does. I’m with you on Coppola’s Dracula too it’s a product of the time it was made and a total misfire. Cheers for your thoughts. Glad you are a fan of this film, it is fantastic aye. It made a really great impression the first time I saw it for a high school English class too. I think your thoughts on the Coppola film are exactly mine, though I’ve never been able to express them as well as you. Like you say, the tone is too reflective of when it was made rather than the source material. That weird Cronenberg-esque bat thing he turns into is a great example of how wrong it gets it for me. Just jars horribly with what Dracula is all about.